Last year, after visiting New York, Boston and Philadelphia, I told myself that Chicago should be next on my list of U.S. cities to visit. When my friend Robin, from California, invited me to join her in Chicago for a few days while she would attend a conference and then explore the city, I knew that this was my chance and that I had to grab it. 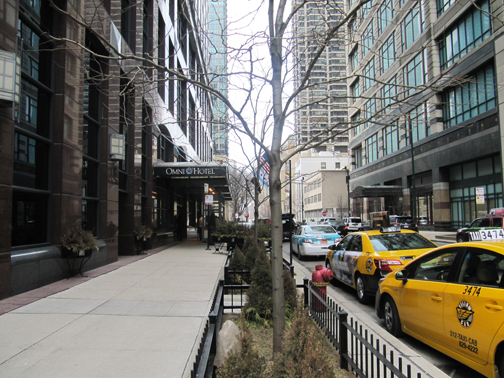 I flew to Chicago and met Robin at the Omni hotel, conveniently located in the heart of downtown on North Michigan avenue, A.K.A. The Magnificent Mile. Chanel, Gucci, Armani, Vuitton and the American Girl Place, where you can get your hundred-dollar doll’s hair styled, ears pierced and face scrubbed at their spa, are all there for your wallet’s pleasure. I explored the city on my own for the first two days, while Robin attended her conference. 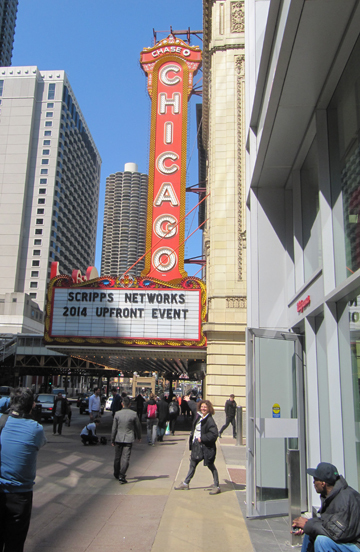 Chicago is easy to navigate, has a relaxed pace and people are friendly. I love the fact that you can walk from the forest of skyscrapers to the beaches that hug Lake Michigan. The Windy City also features world-class art. Day 1, I walked to the Art Institute of Chicago. I enjoyed their impressionist collection as well as the Christopher Wool exhibit. 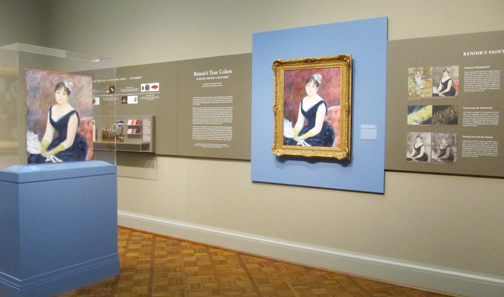 Also noteworthy is Renoir’s True Colors: Science Solves a Mystery. 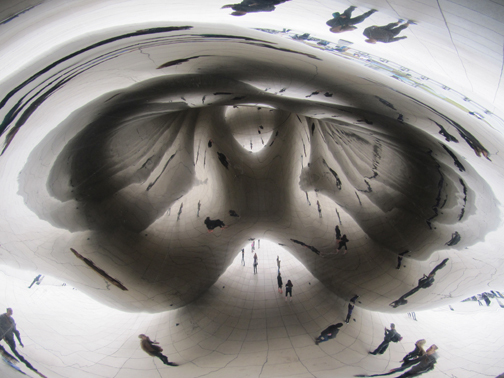 Inside dome of Cloud Gate. 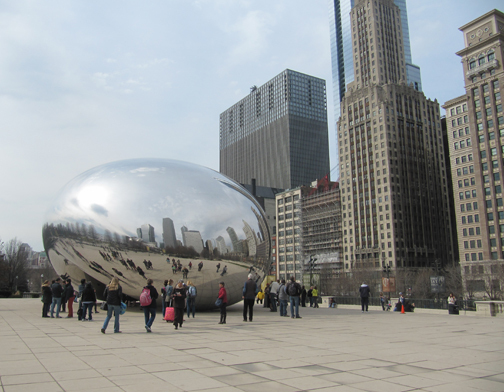 At Millenium Park, I saw Cloud Gate, by British artist Anish Kapoor. This is the most intriguing public art sculpture I have ever seen. I love the way it interacts with its environment, the way people react to it and the infinite visuals it offers as one walks around and though it. The next day I rode the “L” (elevated) train to Pilsen, in the Lower West Side of Chicago. In the late 19th century, Pilsen was inhabited by Czech inhabitants, gradually joined by other ethnic groups of Eastern European descent. 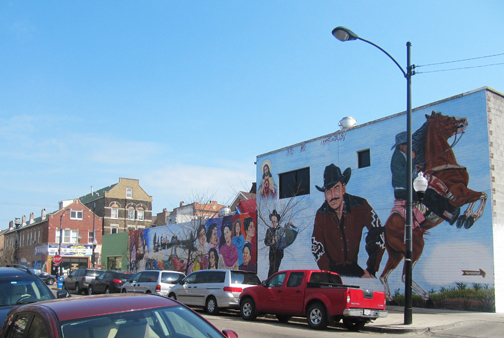 In the 1970s, Latinos became the majority population of Pilsen and today it has a distinctively Mexican flavor. 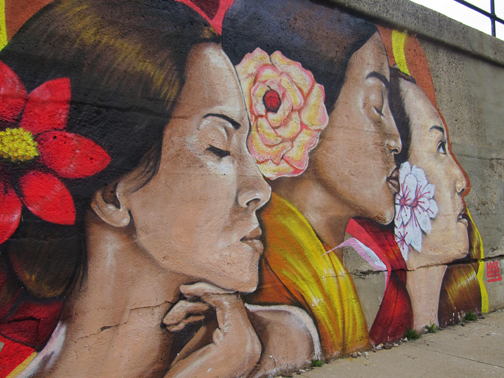 I went mainly to see the murals that color the streets. I was rewarded with a feast for the eyes. Storefronts, doors, cement walls under the tracks on 16th street, all competed for attention from my camera’s busy lens. 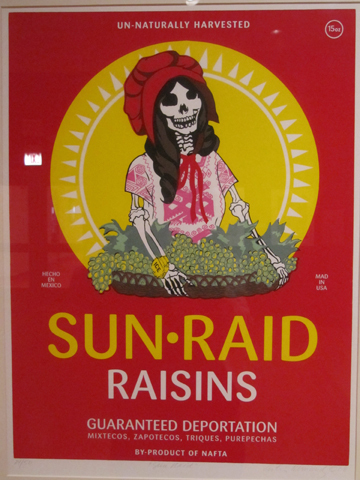 Ester Hernández, Sun Raid, Screen print, 2007. 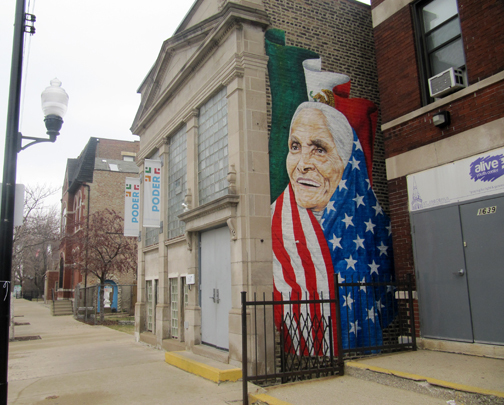 In Pilsen, I also enjoyed my visit to The National Museum of Mexican Art. The exhibition Galería Sin Fronteras, features Chicano based artwork from the collection of professor Gilberto Cárdenas, the founder of Galería Sin Fronteras, in Austin, Texas. 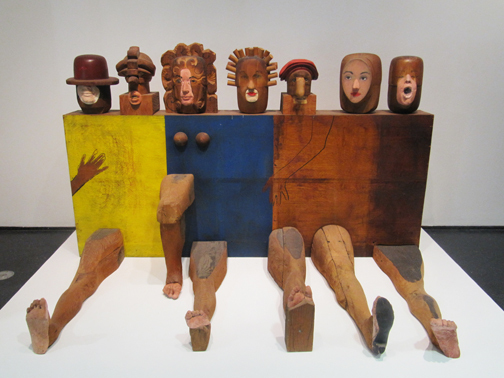 The works in this show reflect the reality of Latin American immigration to the States and convey messages of social consciousness. Back downtown, at the Museum of Contemporary Art Chicago, I delighted in the Warhol and Marisol exhibit as well as the one on Alexander Calder. Next stop, River North, featuring the greatest concentration of galleries in Chicago. I visited Printworks Gallery, where I discovered the etchings and photogravures of Teresa James. I also popped into half a dozen other galleries. My favorite show was by award-winning Chicago-based artist, Jordan Scott at Judy A Saslow Gallery. 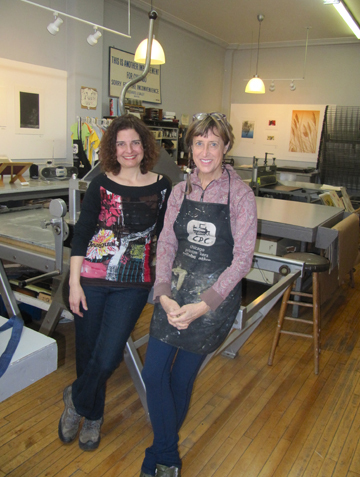 My fourth train ride of the day took me to the Chicago Printmakers Collaborative (CPC) to my rendez-vous with Deborah Lader. Besides being the founder and director of CPC, Deborah is an artist, a master printer and a musician with the Folk group, Sons of the Never Wrong, for which she is a multi-instrumentalist, a vocalist and a song writer. It was inspiring to talk with Deborah. 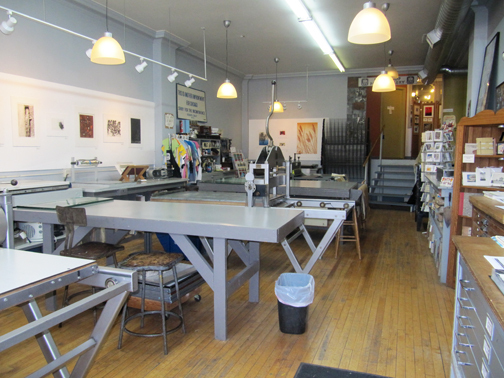 The studio has a warm feeling to it and the space is well organized, with an etching press, a lithography press and a combination press. I was lucky to catch their exhibit, New York Society of Etchers. CPC is celebrating their 25th year and their future looks bright and promising. Back at the Omni, at the end of day 2, after a tasty meal at Su Casa with Robin, and my nightly swim, my head was dancing with all the images and sights I had seen in Chicago. I couldn’t wait to share the next two days with my travel companion. Stay tuned to my next blog on Chicago architecture and chocolate!